The ProForm Power 1295i is a strong treadmill from the ProForm Power line of treadmills. With its strong 3.5 CHP motor, it is up to multiple, daily users of varying physical fitness levels. It has a challenging incline ability, ranging from 0% to 15%. With the ability to incline up to 15%, even a walking workout can be brought up in intensity without additional stress on your body. We consider the Power 1295i a good option for its price. The Power 1295i retails for $2,499 but often goes on sale for $1,299. Want lots of workout options - There are 34 workout programs built into the Power 1295i. It is also iFit capable so you can unlock more workouts, personal trainers, meal planning help and more. Like high-tech equipment - With a 7-inch, high-definition touchscreen, users can browse online while working out. Need a well-cushioned treadmill - While the cushioning is non-adjustable, the ProShox™ cushioning on the Power 1295i is excellent. We were pretty impressed with the features on the Power 1295i, especially for the sale price. Strong motor - The Power 1295i comes with a 3.5 CHP motor. This motor has smooth action and is strong enough for multiple daily users. Great versatility - Equipped with the strong motor and cushioned deck, the Power 1295i can appeal to everyone from walkers to elite runners. High weight capacity - Along the lines of versatility, the Power 1295i has a high weight capacity of 350 lbs. Most of the more high-tech treadmills only have a 300 lbs capacity, so it is great that this is available to those who may be easing back into working out. 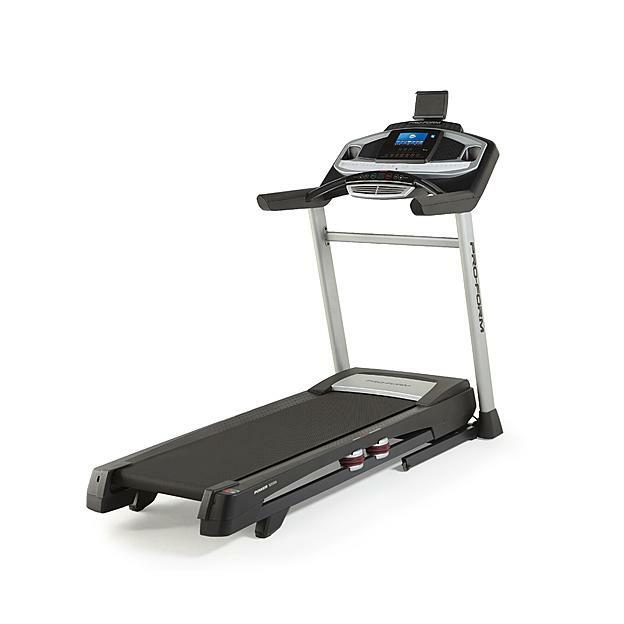 Overall, the Power 1295i is a good treadmill and should be one you should consider if the above are selling points you are looking for in a treadmill. Footprint In Use (W, L, H): 37" x 81" x 66.7"
Motor Size - The motor in this treadmill is 3.5 CHP. At this size, the Power 1295i is suited for users ranging from walkers to runners. It has a strong action while still being fairly quiet for a motor of its size. Running Area - The running surface is a textured, non-stretch treadmill belt. The belt itself measures 20” by 60” which is plenty of room to workout. Weight Capacity - With one of the higher weight capacities of the ProForm line, the Power 1295i has a weight limit of 350 lbs. Folding - This treadmill can fold up easily thanks to the EasyLift™ Assist hydraulic system that ProForm has built into the Power 1295i. Space / Footprint - The Power 1295i is a pretty good choice for space-conscious people who still want a quality treadmill. It measures 37" wide, 81" long, and 66.7" tall. This treadmill can fold up compactly and is light enough to move easily in case you need to tuck your treadmill away after a workout. Max Speed - The treadmill’s max speed is 12 MPH which is industry-standard for treadmills in this price range. Incline - This treadmill has an incline range of 0% to 15%. You can amp up your average workout just by adjusting your treadmill’s incline level and burn calories faster. Workout Apps - There are 34 workout programs built into the Power 1295i. You can choose from cardio, strength, interval, speed, hill, and heart rate programs. This treadmill can also access iFit once you have a membership. With iFit, you can virtually run in locations all around the world. Display - The Power 1295i comes equipped with a 7-inch, high-definition touchscreen. You can browse online and flip between your entertainment and your workout data. The screen is mounted in a fixed position but angled to be easy to see for most heights. Speakers - Two, 3-inch speakers are located on either side of the treadmill display. Sound quality is fairly clear up to the mid-high volume levels. At the last two highest volume settings, the sound does lose some clarity. Fans - Equipped with ProForm’s patented CoolAire™, you can choose from 2 different fan speeds to cool yourself off during your treadmill workouts. Heart Rate Monitoring - Using the EKG handlebar grips, you can track your heart rate on the Power 1295i. They aren’t the most accurate measurements, so if you have another way to measure your heart rate, we recommend you use it. The Power 1295i has a lightweight, sturdy frame. Its crossbar keeps the console steady if you want to break into a run, and the treadmill arms are strong enough to lean on comfortably. The side rails are slanted with textured bumps to help you keep your footing. We weren’t thrilled with the slanted side rails as it is possible to place your foot too close to the moving treadmill belt, but the rails did not hinder any of our testers. There is also a good hydraulic system on the Power 1295i. It makes moving the treadmill deck up and down much easier. The rubber feet on the base of the treadmill cushion the descent of the treadmill deck as you can allow it to go down hands-free. With so many treadmills out on the market, it can be hard to sift through them all to find the right one for you. One way we classify treadmills is looking at their cost versus the features offered. Using that method, the Power 1295i had a good price to features ratio. as well as other great features. These features were just as good in person as we tested this treadmill, which convinced us to recommend the Power 1295i as a good option for your future treadmill. We almost always will recommend you purchase your treadmill through the manufacturer. ProForm has several ways you can contact them so they can answer any questions you may have about the Power 1295i. Through ProForm, you can secure the most up-to-date model of your treadmill and also receive superior support.